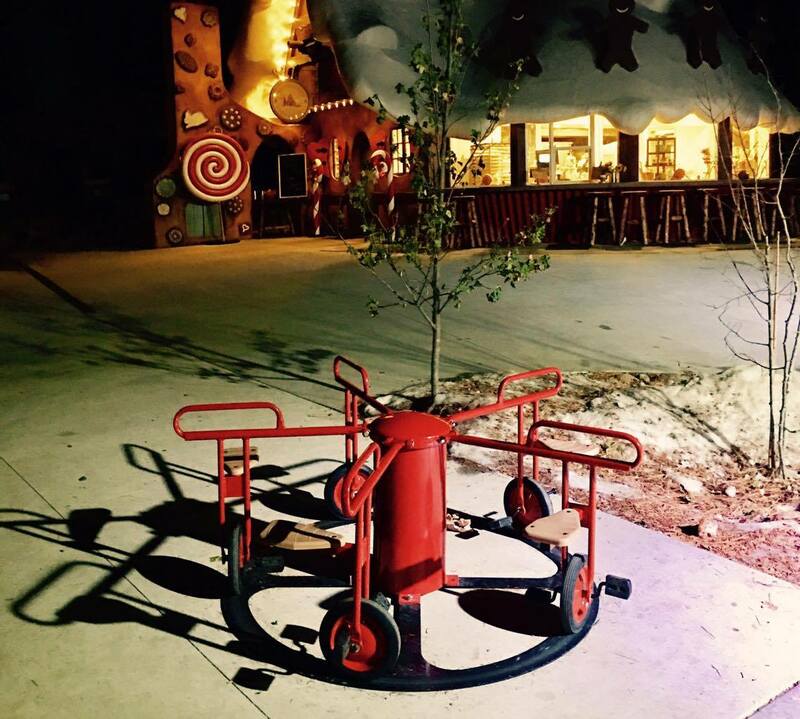 SkyPark at Santa’s Village reopened late 2016 after a long phase of closure. We enjoyed their opening weekend and had a blast! We’ve been back several times since then and fall in love with this park more and more each time we go. 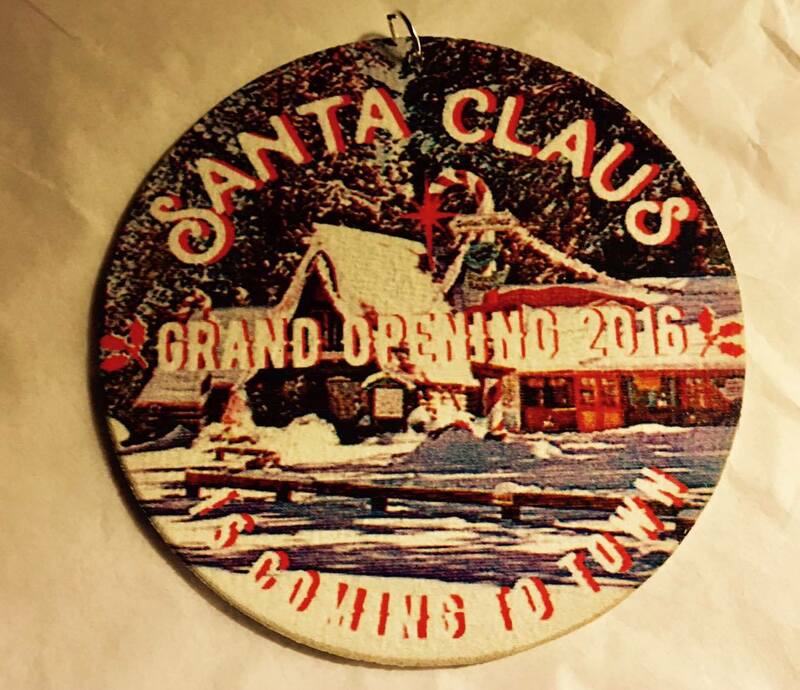 We attended Opening Day for the 2017 holiday season and will be back for 2018, too. This park keeps getting better with every visit. It is unlike any you have seen before. Their plans for expansion include so many wonderful things. I can’t wait to take my kids back. Check out lots of details on what you can expect. In addition to annual holiday visits to see Santa and celebrate Christmas, I could see this park as a really cute date idea. I could also see it as a darling venue for a younger child’s birthday party with a few friends. 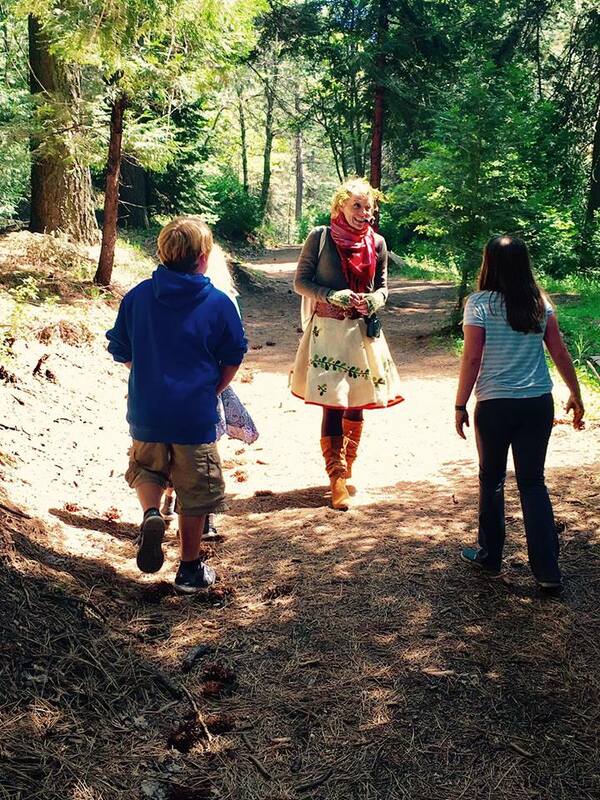 When I first visited, I took my then 9 year old daughter and 10 year old son and they had the best time. We are there before opening (10:00am) and we stayed until close (6:00pm). Park hours vary, depending on when you visit. Check those out at this link. 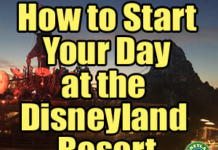 The park is just under 2 hours from Oceanside (where I live) and about an hour and 20 minutes from Disneyland. This treasure opened 6 weeks prior to Disneyland in 1955. It enjoyed a good run and then some financial difficulties, causing it to close its doors in 1998. After battling a severe bark beetle infestation, one of the state’s worst wildfires in history – the “Old Fire” of 2003 – nearly destroyed the land completely. Finally, after nearly 20 years, the park reopened on December 2, 2016. It has been entirely redesigned in many ways, but some structures and theming from the past park have been restored, including 18 log buildings. 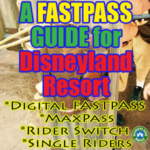 The “new” park differs from others because all attractions are powered by the guests. 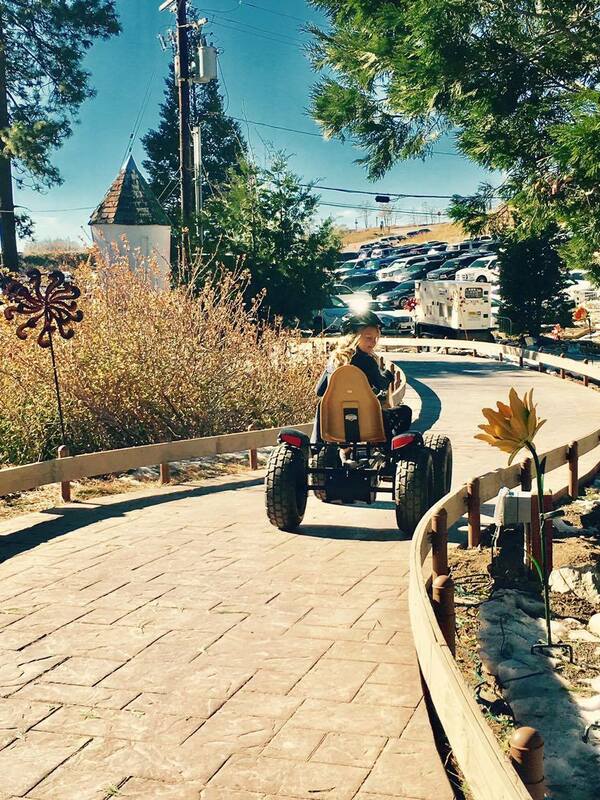 Meaning, the cars at Arrow’s Adventure are pedal-cars, not on a track like the Autopia at Disneyland that we’re familiar with. 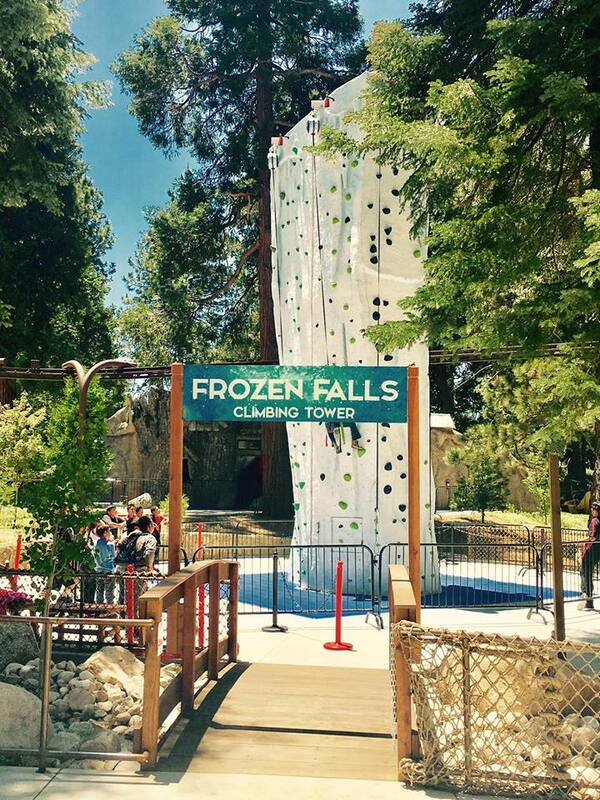 You can ice skate, rock climb, make a craft, decorate cookies, mine for gold, zip line, ride a bike through the San Bernardino Mountains, shop, dine and more. 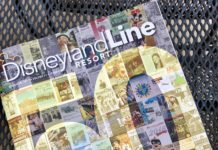 With the exception of the train that runs through the park, all activities – now and in the future – are driven by the guest’s energy. 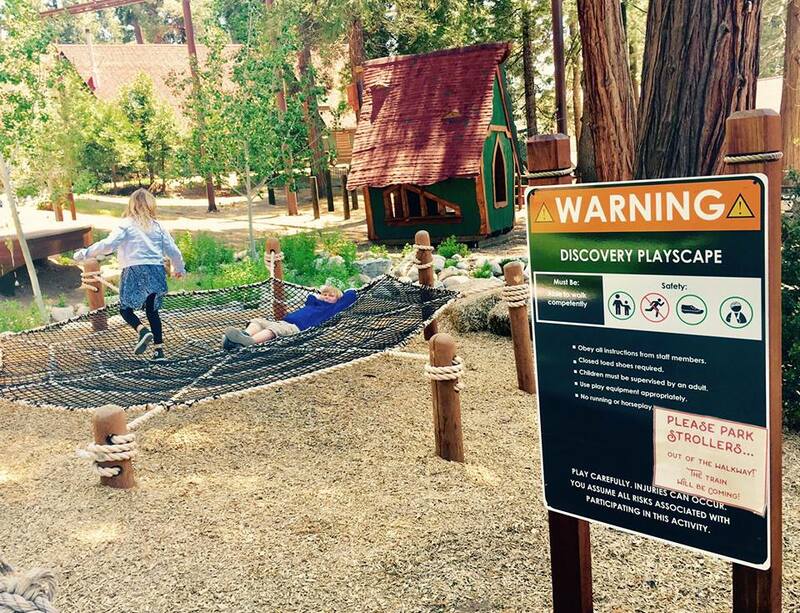 This park has a huge focus on exploring the outdoors and beautiful San Bernardino National Forest. We loved the nostalgic feel of the 1950’s fantasy village, the entertainers, the attractions, and the overall ambiance of the area. While it’s only just over an hour from Disneyland, it feels like you’ve stepped back in time and into another world. What makes this park unique, too, is the people who own and operate it. This is an absolute labor of love for them. In a world filled with technology every where we turn, these people dared to restore a park without a single 3D temptation. I love their vision and encourage you to venture out to see more of what they’ve created. 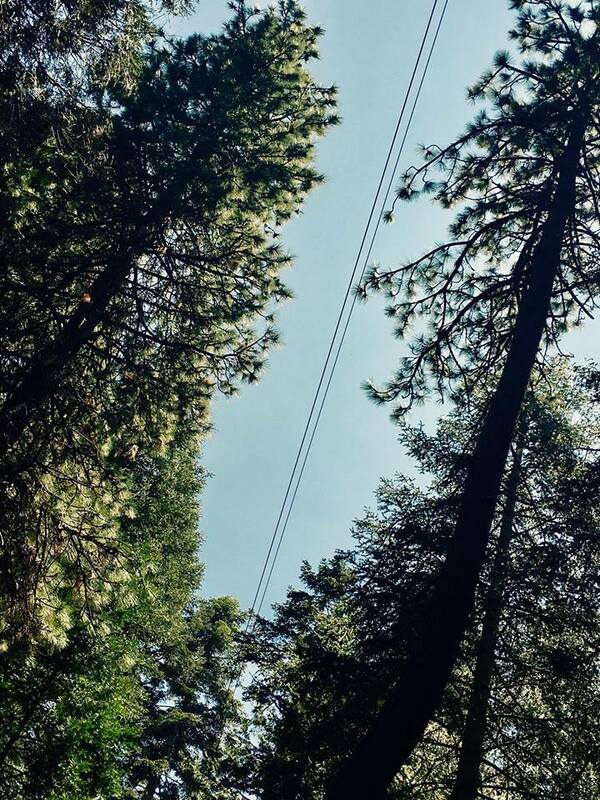 The park is located in the San Bernardino National Forest in Skyforest, California. 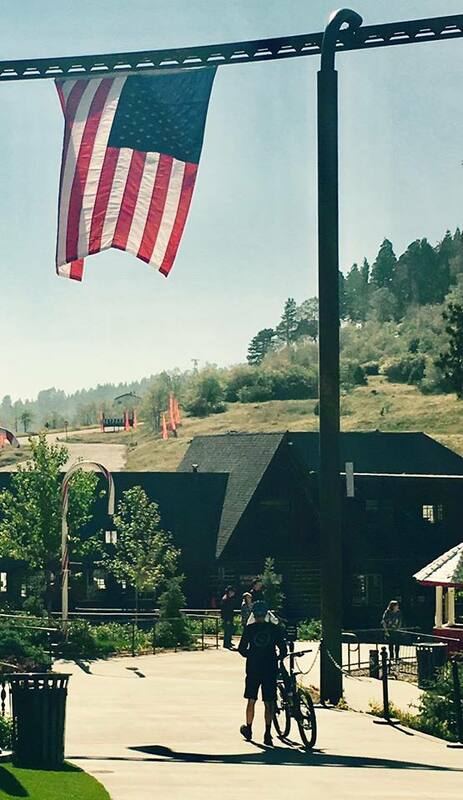 The elevation is 5,910 feet. It sits on the scenic Rim of the World Highway (Route 18). It’s about 23 miles from one of the largest and most popular ski resorts in Southern California, which is Big Bear/Snow Summit. We have skied both of those resorts and most others in this area many times since moving here. 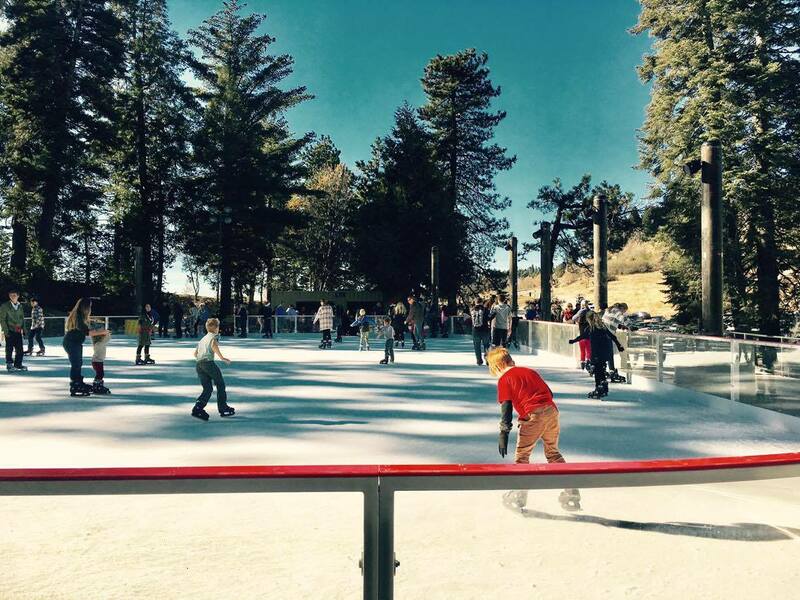 If you’re planning a ski trip, consider adding a day for this park. 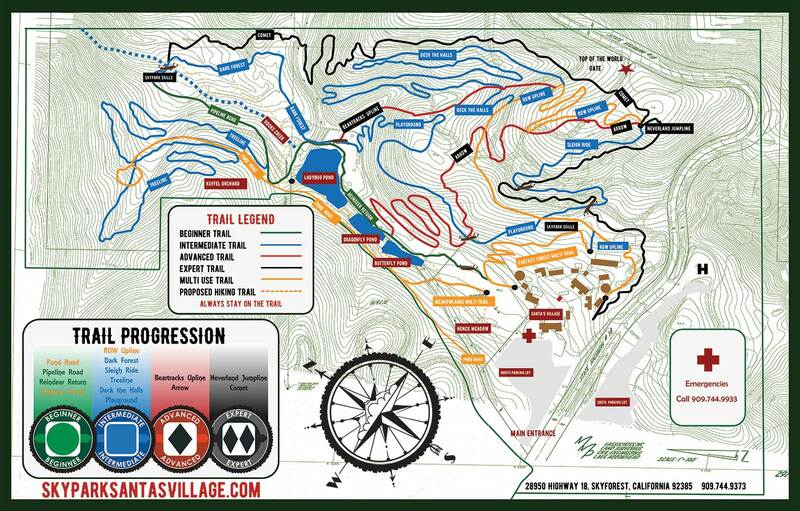 Snow Valley is the closest ski resort and is only about 7 miles down the road. Visit this link for tips on where to stay if you wish to spend a couple of days in the mountains. 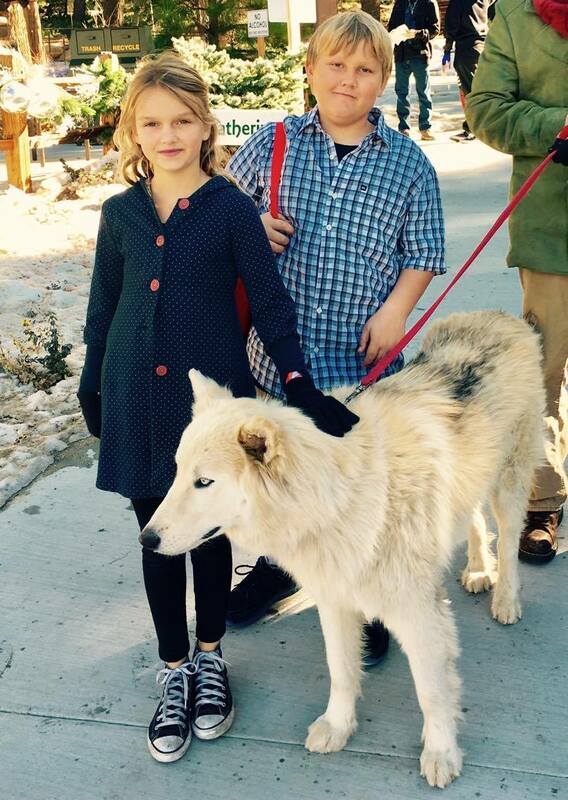 The park is open from 10:00am to 6:00pm most days, and is closed on Thanksgiving and Christmas. Outside food and beverages are not allowed in the park, however, you could bring a picnic and eat it in your car if you wish. The parking lot is right outside the park. 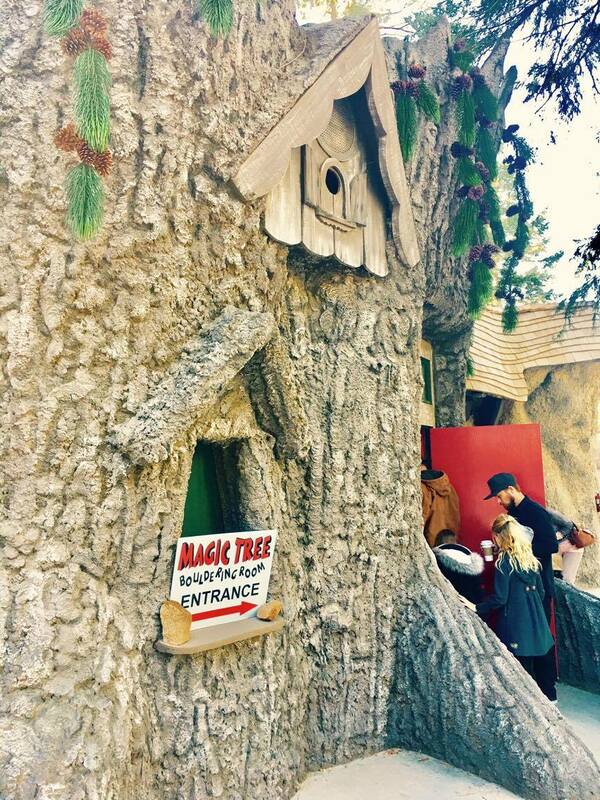 All guests must sign a waiver before entering the park. This can be done online or at the time of arrival. Just like Disneyland, this park took 1 year to create, start to finish, and opened in May of 1955. And, then many decades later…….it took 30 months to restore and transform the park to what it is today. 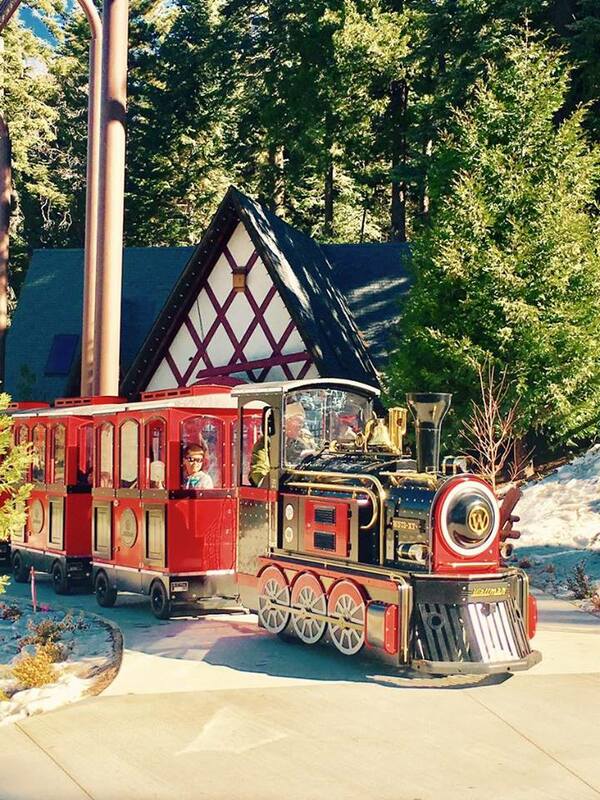 Santa’s Village was the first franchised amusement park in the U.S. with locations in Dundee, IL and Scotts Valley, CA, as well as the original in Skyforest, CA. Check out some Frequently Asked Questions before your visit. 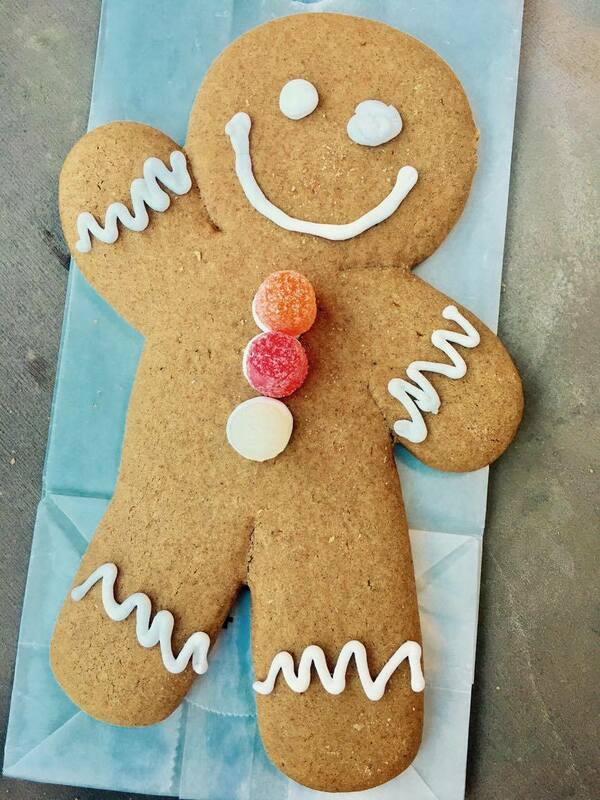 We are busy from open to close, with only a break for lunch and gingerbread. Take a look at all you can do. 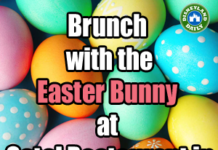 Check out this link for all the current attractions. 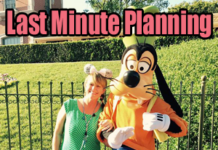 In addition to enjoying the attractions, save time to shop and dine. And, bring your ’emergency only’ credit card for the shopping part. I haven’t left the park yet without spending at least $100 on cute decor and apparel. 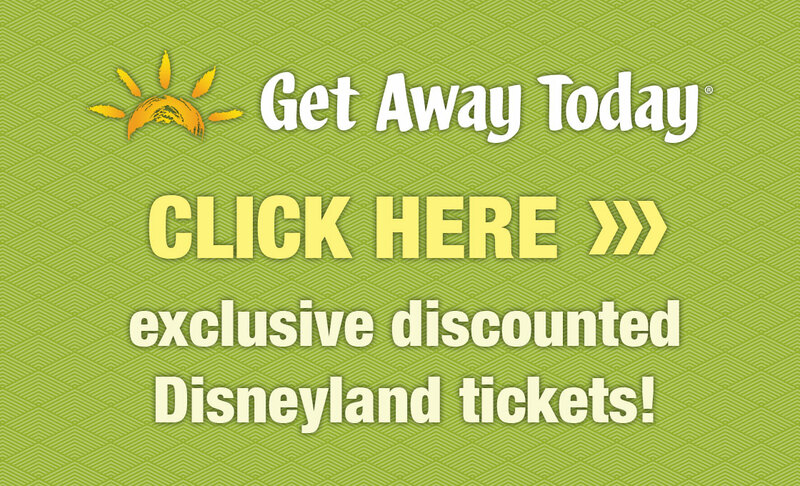 *Everything you need for these experiences is included in the cost of your ticket. Ice skates for skating, shoes for rock climbing, etc. You will only need to purchase food, drink, and souvenirs as desired. There are optional activities if you want to spend more. 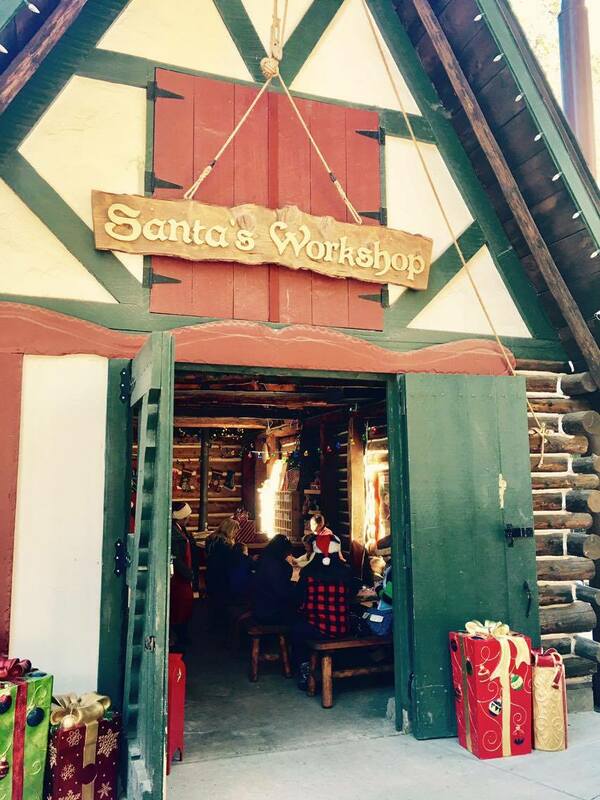 Breakfast with Santa, Mrs. Claus’ Tea Party, Workshop crafts, etc. 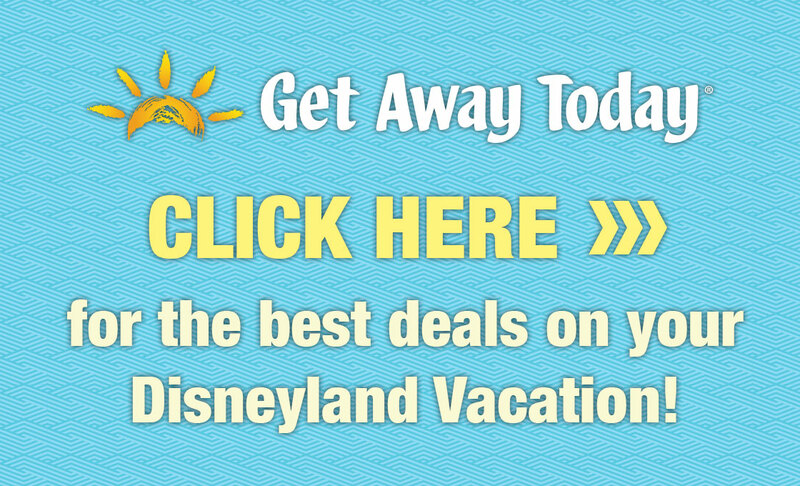 But, you can absolutely visit without spending more than your ticket cost. *Disneyland fans should consider the Making Spirits Bright Tree Lighting Parade simply a tree lighting. 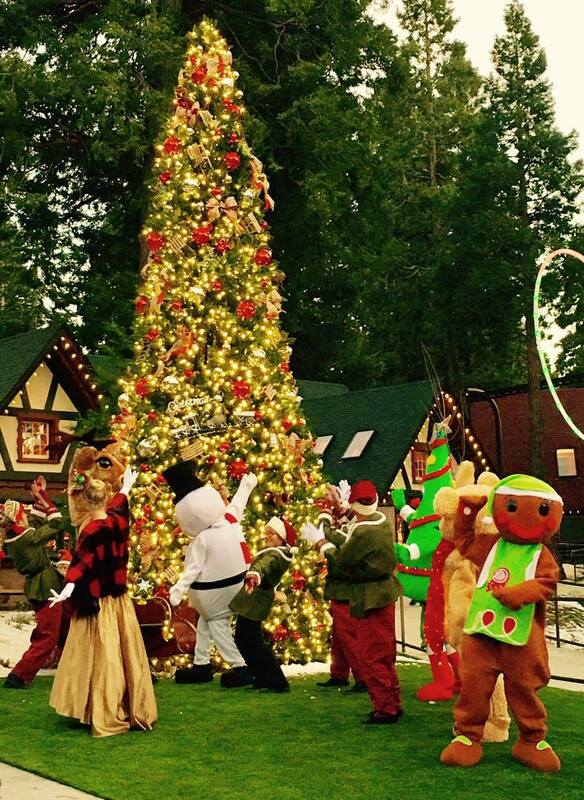 Characters will walk down Candy Cane Lane with Santa to light the tree in a brief ceremony around 4:30pm each day. This is not a parade like what we know at Disneyland. I encourage you to see it, but think of it more as an elaborate tree lighting. It’s precious. *Since sharing my interest in this park on social media, I’ve heard a few people complain about the price. Most who don’t care for the cost visited the park decades ago when attractions were individually priced. I encourage you to think of the park like this: If you priced out ice skating, rock climbing, zip-lining, a train ride, bungee trampoline jumping, and archery, for example, you would far exceed the cost to get into this park – and only have a few things to do. Each of these activities is pricey on its own. This location incorporates the few I mentioned……..plus so much more…..for one cost well below what you would be charged to do them all. Plus entertainment and great service! There are a few dining options at SkyPark. St. Nick’s Patio and Grille – Burgers, sandwiches and salads. And, soup in a bread bowl for only $5! 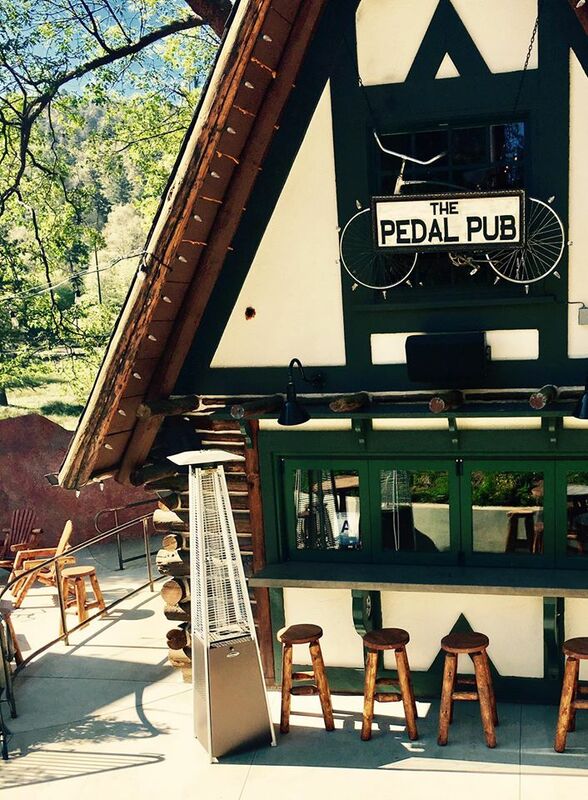 The Pedal Pub – Craft beer and bar food. This is where most people end up in the later part of the day. 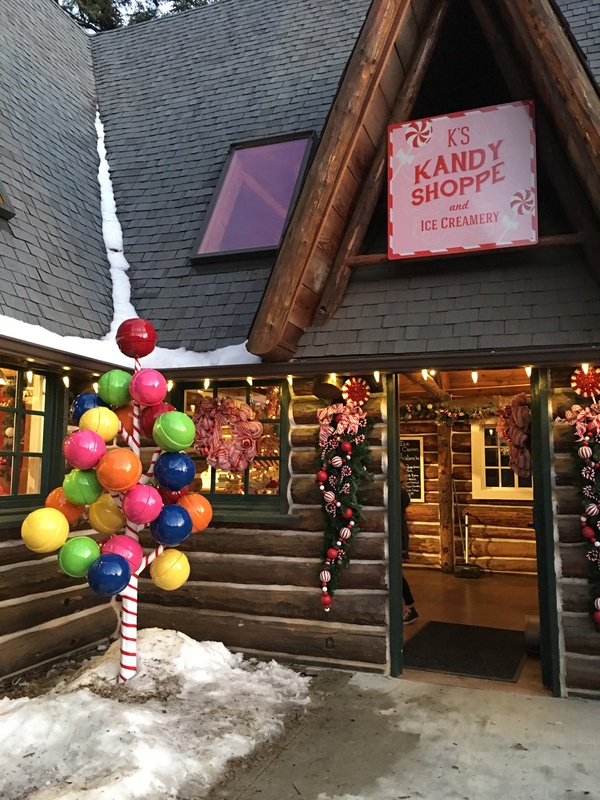 K’s Kandyshoppe and Creamery – Delicious handmade candy and ice cream. Lots of vintage options, too. 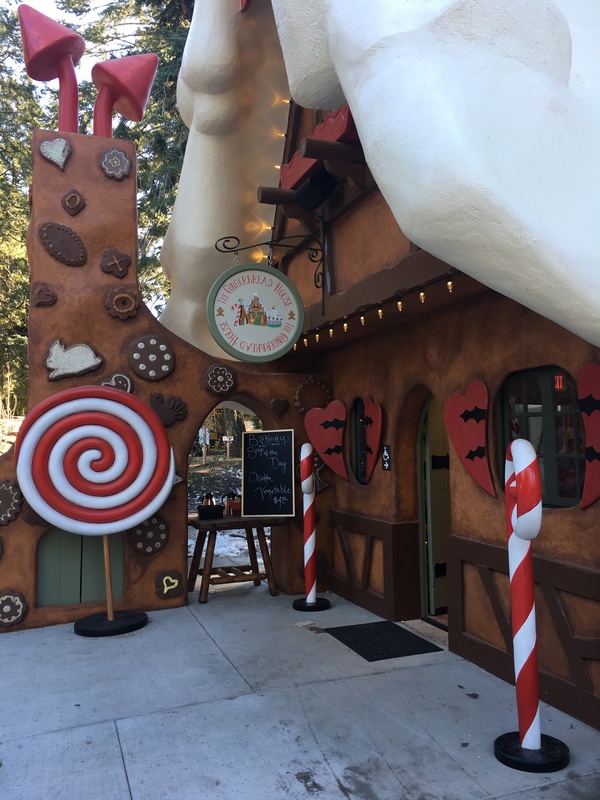 Gingerbread House – Sweet treats and hot cocoa. 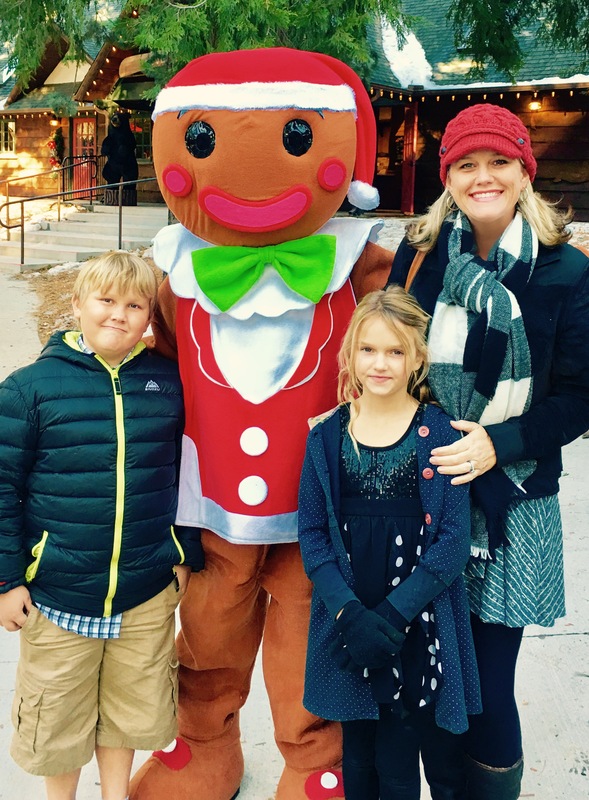 Every time we visit, we get a gingerbread man, a sticky bun and Gingerdoodle cookie. Try all three. Trust me. 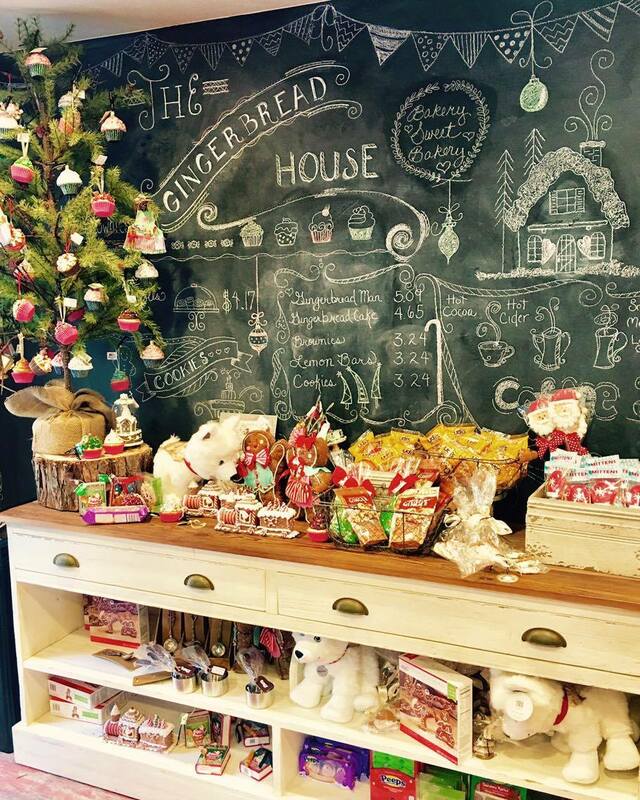 Kringle’s Coffee and Gifts – Hot cocoa, too! I’m always in search of cocoa with kids. I escape to this shop in the evenings when my crazy kids aren’t cold and I’m freezing. Gatherings – The park’s answer to BBQ. This is a great value for what you get. The setting is darling, too. My notes on dining: We always eat lunch at St. Nick’s and it’s good. The grilled cheese is delicious and the chips are made on site and super fresh. 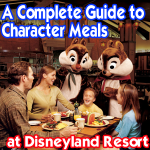 Try the soup in a bread bowl for nearly half the price of what you will pay at Disneyland. 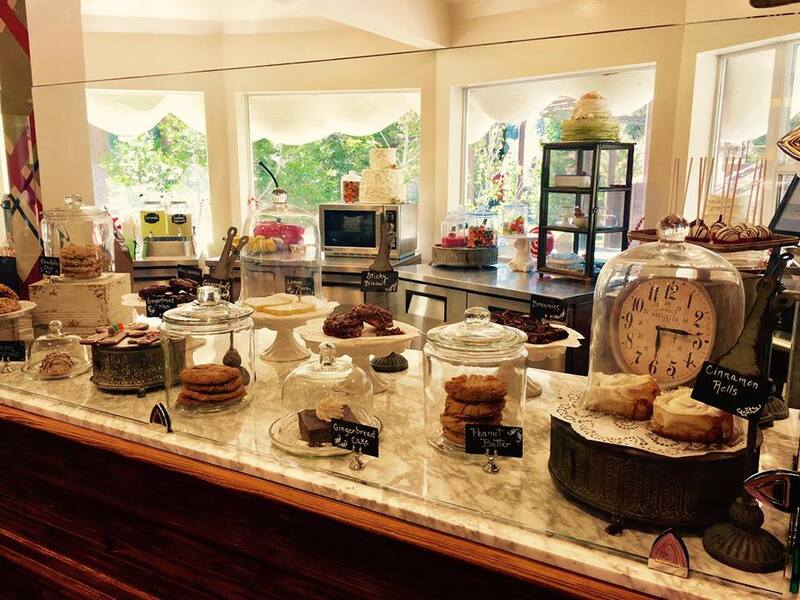 The Kandyshoppe has really reasonable prices including $3.50 slices of fudge that are HUGE! Gingerbread House was my favorite. 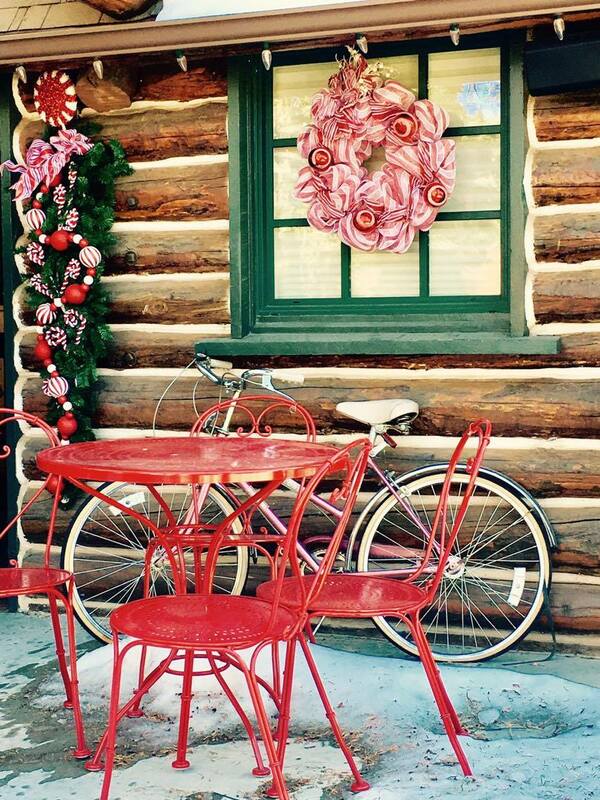 Every location was beautifully designed and decorated. My notes on shopping: There are several really cute stores on site. Sky Trading Co. is the biggest and most thorough option. 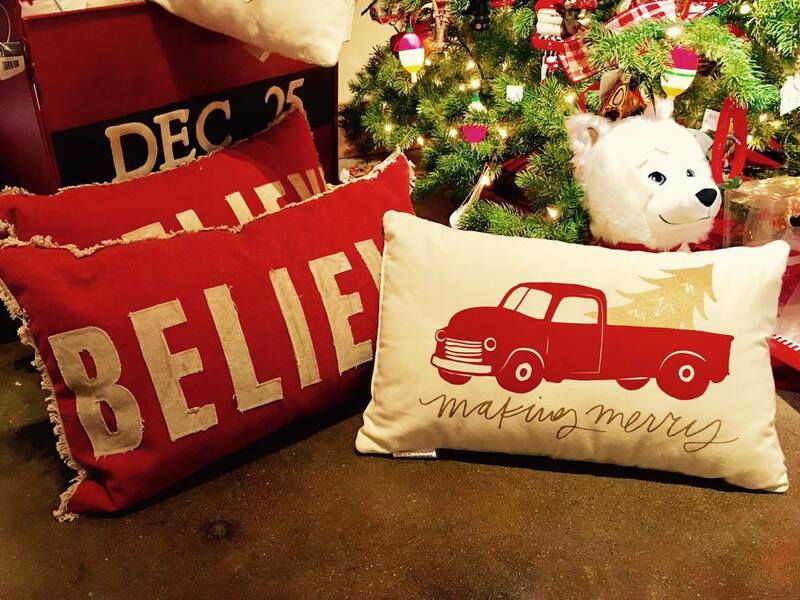 It has everything from toys to decor to apparel. There are so many beautiful things. The pillows, kitchenware, ornaments, etc, etc. I could have spent a fortune. The kandyshoppe. 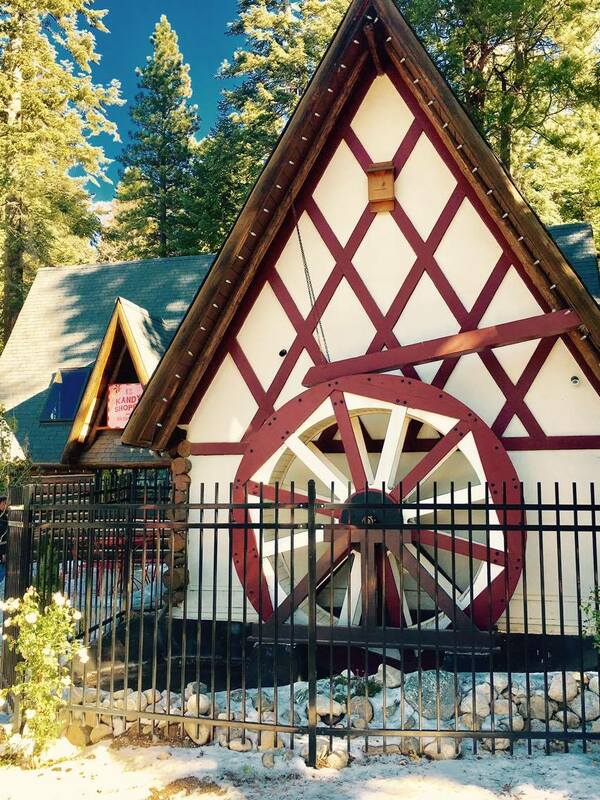 The waterwheel is from the original park. 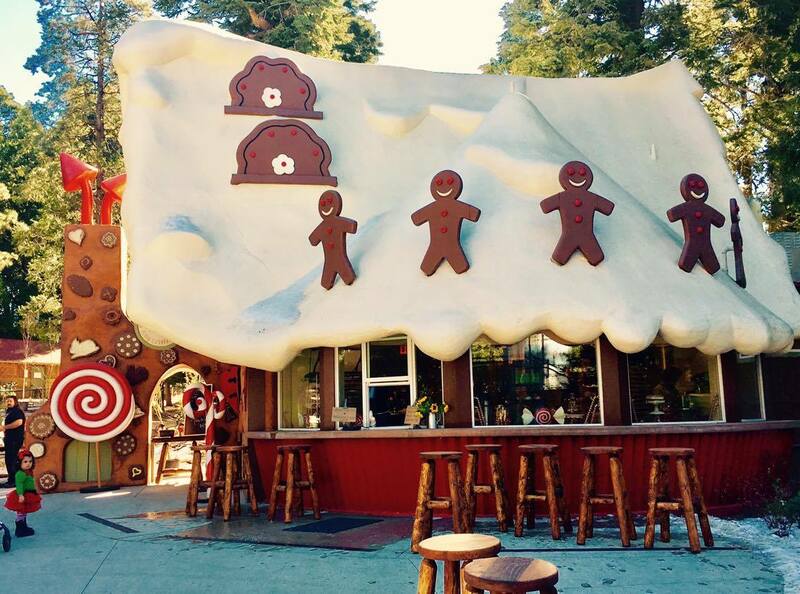 The darling Gingerbread House. It’s so picture perfect inside and out. 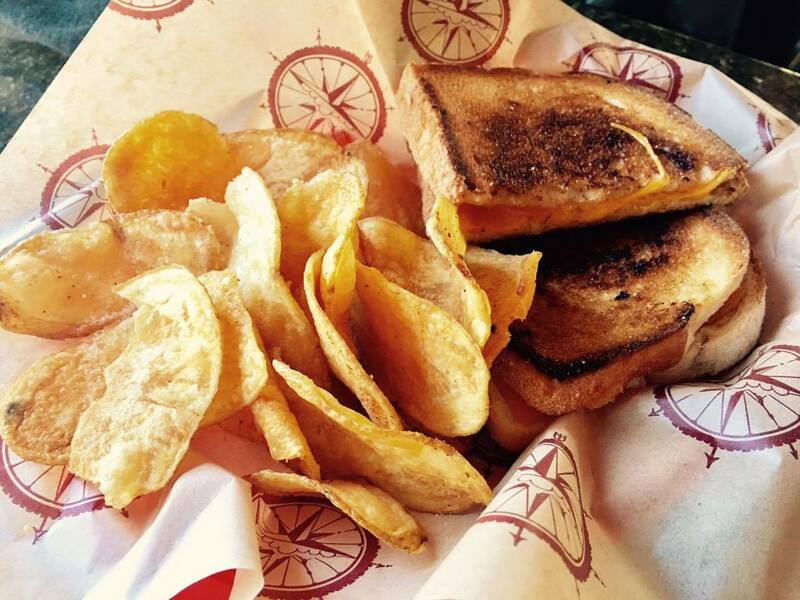 Grilled Cheese Kids Meal at St. Nick’s – only $6.00. 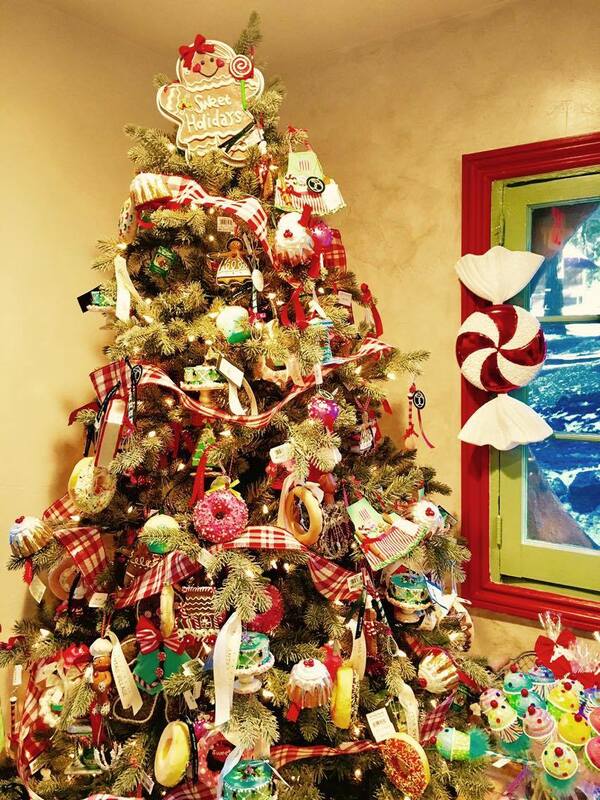 I want a cupcake and donut tree. Love both of those pillows. Peaking behind the one on the right is a plushed animal named Arrow, who is Santa’s dog. He’s famous at the park and you’ll see lots of kids carrying these around. They’re $24.99 each. Lainey wanted one, but it wasn’t in our budget. So sorry, poor Starnes children. The entire Santa experience was lovely. We went as soon as we walked in the park and I’m so glad for that. The line was long all day. Santa sees children from open to close, with the exception of a break at lunch time, the occasional cocoa and during the tree lighting in the early evening. 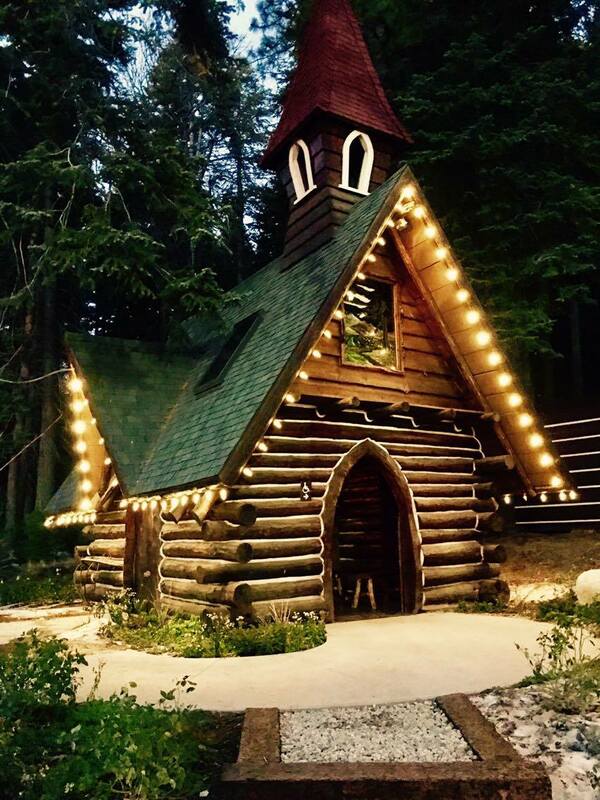 One family or group at a time entered the charming cabin for some time with Santa. 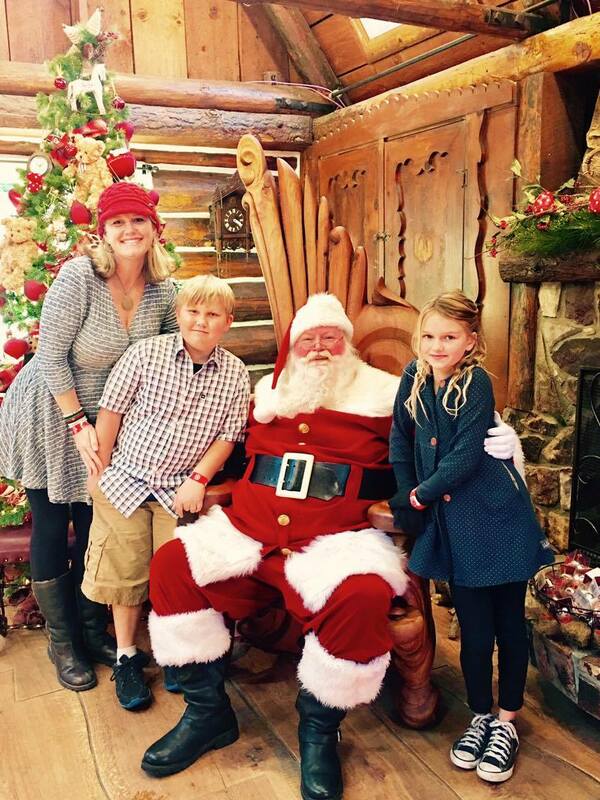 My kids signed the “Good List”, told Santa what they wanted for Christmas, and took a photo. Upon leaving, they were each given a candy cane. After exiting the cabin, we took a right to see the famous “North Pole”, a frozen pole just outside. Always so fascinating for kids. Don’t let them put their tongues on it. Don’t be like us. 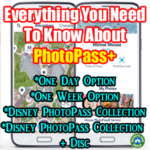 You may offer your phone or camera for the elf to use to capture your photo with Santa or you can purchase the image the park takes as you exit the park at the end of your visit. Easy peasy. 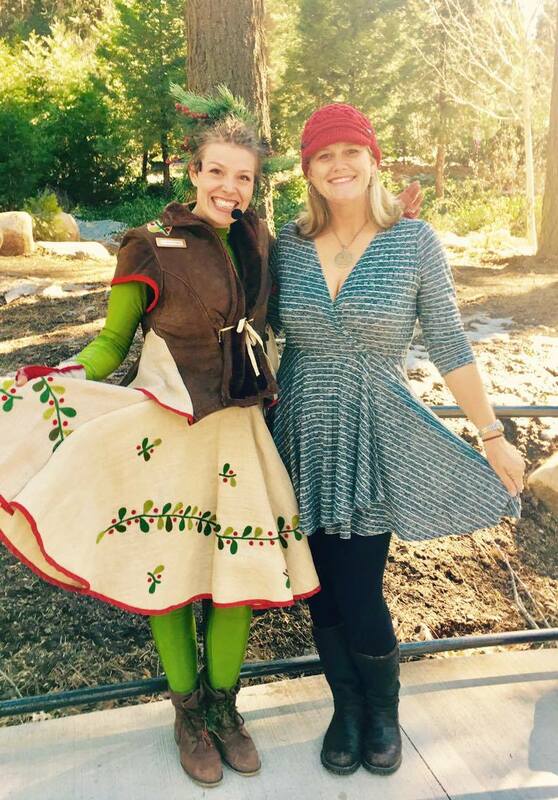 The elves are darling. I asked her for a photo. I’m sure she was all, “Ok, Crazy.”, but she was very polite. About 20 times during this visit, I wanted to scream, “I do this all the time at Disneyland!” somehow rationalizing my behavior, but I withheld. My kids said it wouldn’t have mattered anyway. 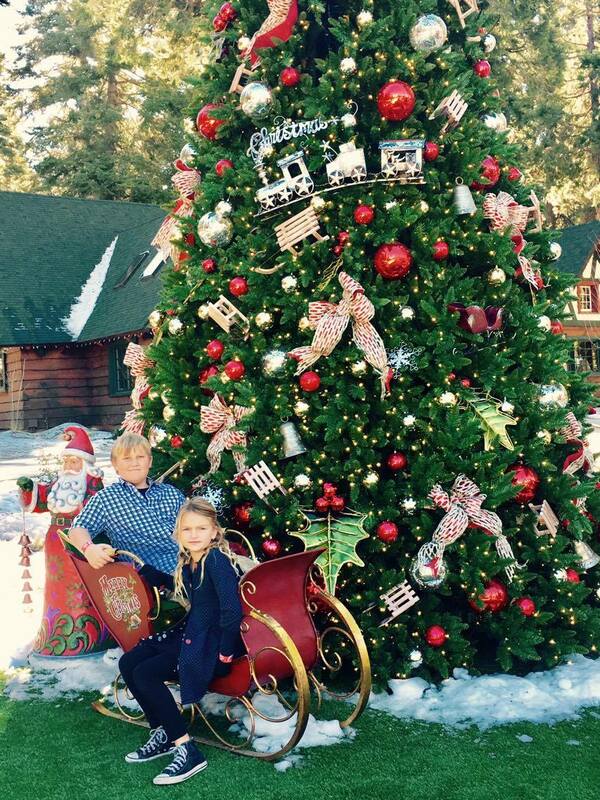 If you fail to see Santa, you can bring your letter from home and drop it in the mailbox outside Santa’s house. 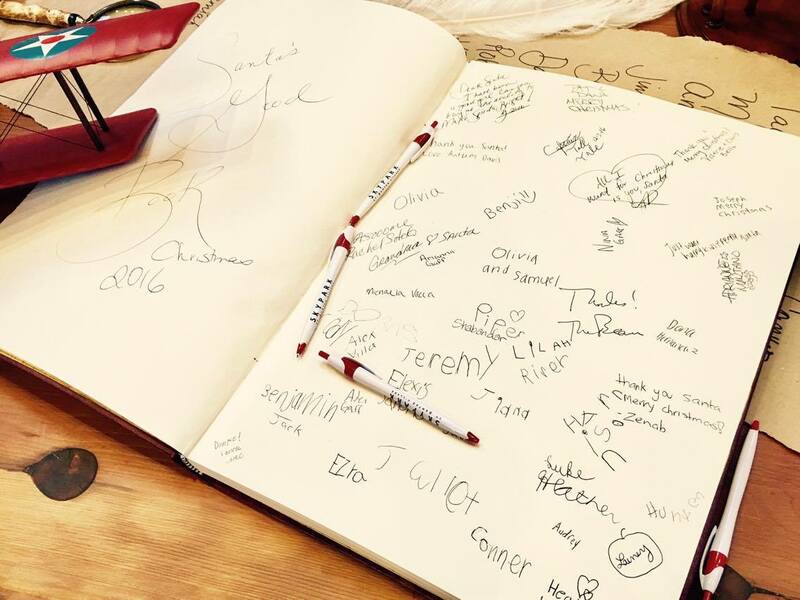 Or, you can create a letter for free at Santa’s Workshop on site and then deliver it here, too. So so many…….this place has the best photo ops. 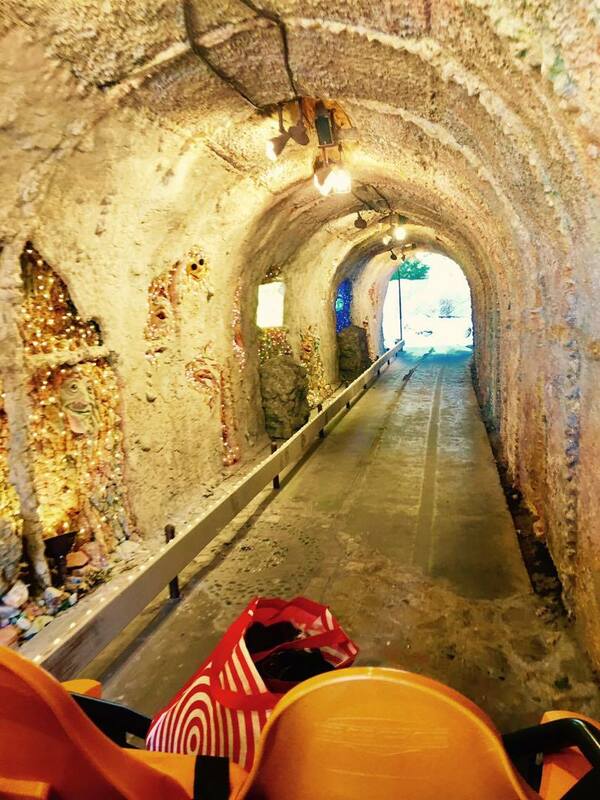 Here we are in the tunnel of Arrow’s Adventure (the pedal cars). Lainey went solo. There are one seater cars and 4 seaters. This is my kids’ favorite thing to do here. What’s up with the GQ poses? These two obviously get their posing skills from me. Lainey and Princess Sugar Plum. Here is the workshop where you make crafts. This closed at 4pm on our visit so that they could be ready for the tree lighting at 4:30pm. 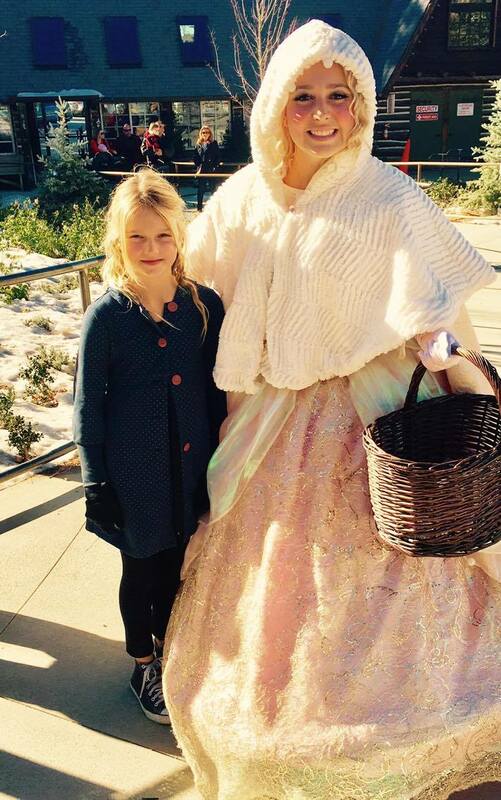 Check the timing on your visit if crafts are on your list to do. This was my kids’ second favorite thing to do, after the pedal cars. It’s a large room where kids can climb everywhere. 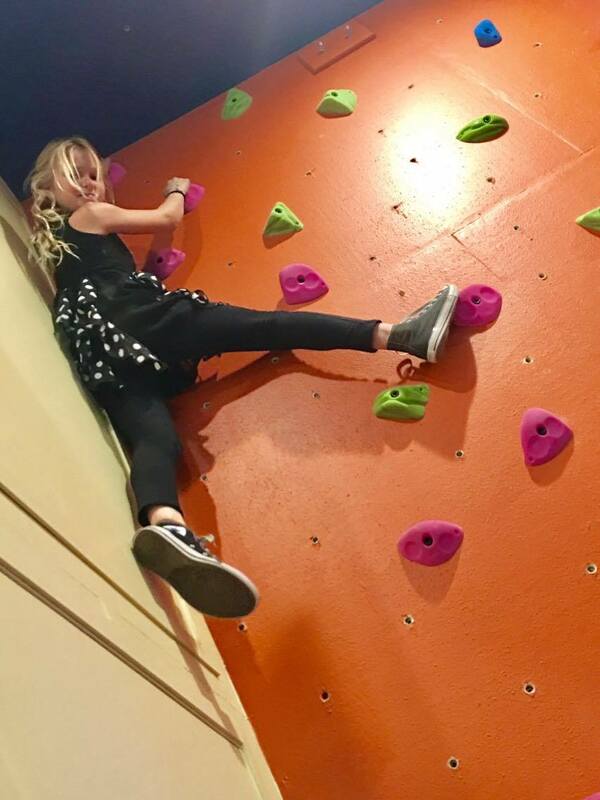 Lainey likes to climb the highest. 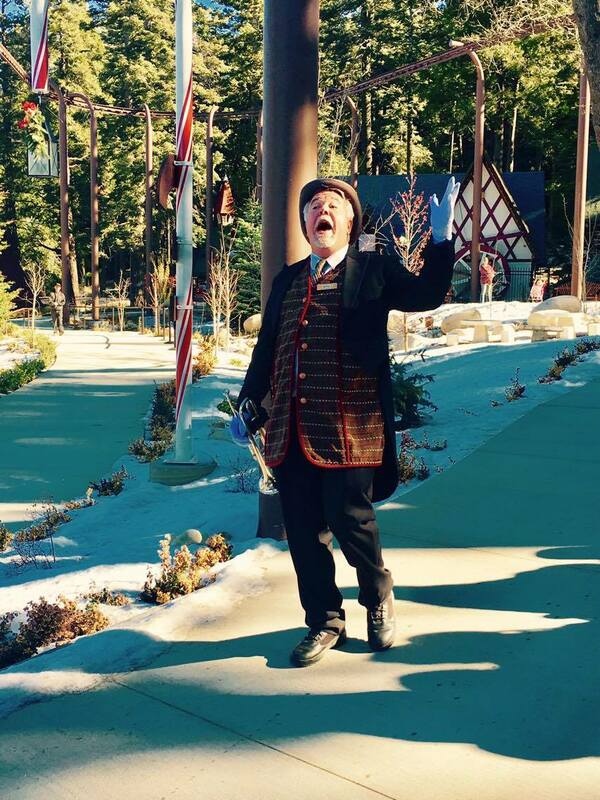 The Town Cryer! He was a gem. The ice rink is quite big. But, if you ask your kids for a sweet picture, your daughter will be difficult. It’s part of Christmas. 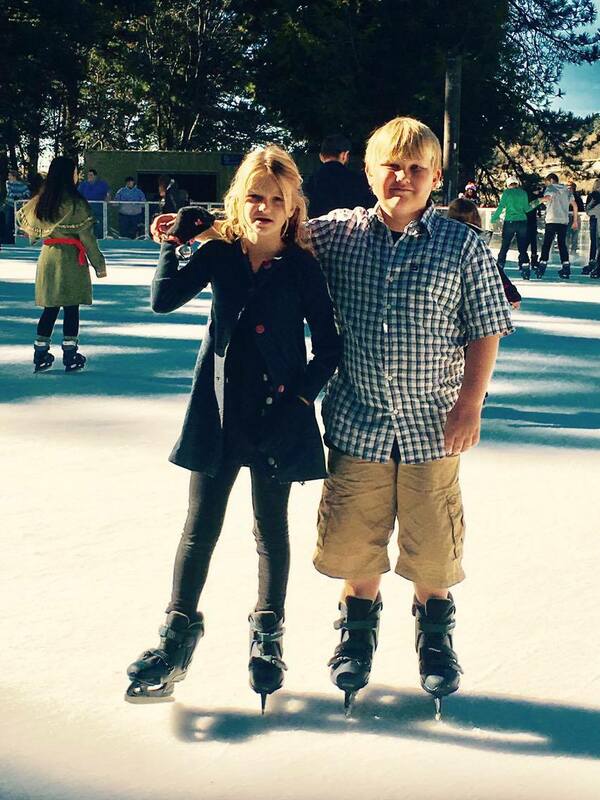 They have since had roller blading instead of ice skating, so you could do that instead. Our tour guide, CJ Kufflebug. She’s an original. So much fun! Mining. SoCal kids are pros at this after field trips throughout elementary school. Darkness arrives and the park gets chilly, but pretty. Love these old fashioned touches throughout. This merry go round was a big hit for preschoolers. Fires are lit and lights are on. The park feels different at night, just like Disneyland. *Visit Santa first. Absolutely first. Then, ride the train. These remain the most popular things to do because they accommodate all ages and are essentials for most guests. *Dress for weather cooler than what the forecast says. It was chilly! With each of our visits, we are surprised – even in the summer – with how cold it is at night. Layer, layer, layer. *Most guests leave not long after the tree lighting. If the park is open late and you have the time, stay late. The park is so nice at night. 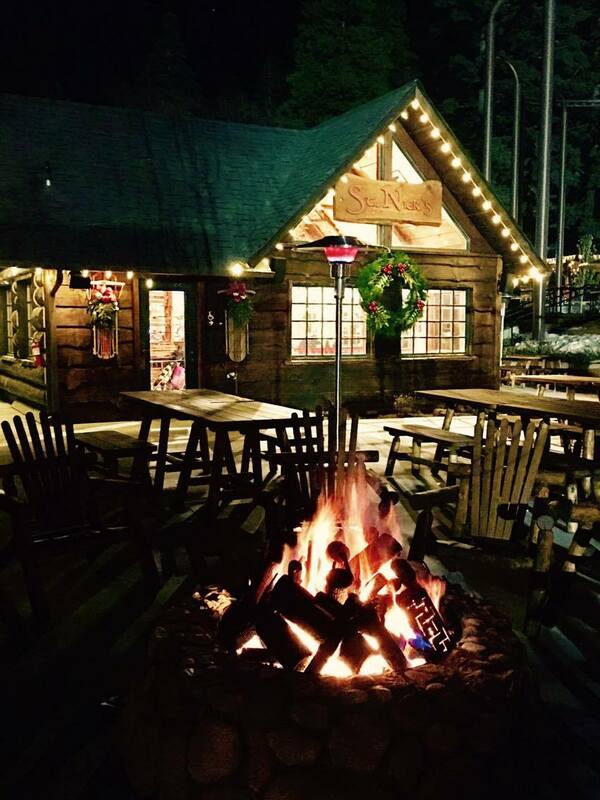 Grab a hot cocoa and if it’s not too chilly, stay until close. See above info regarding Winter Visit info and then add the following…..
Pricing is less expensive in the summer months. Check out this link for what you can expect. 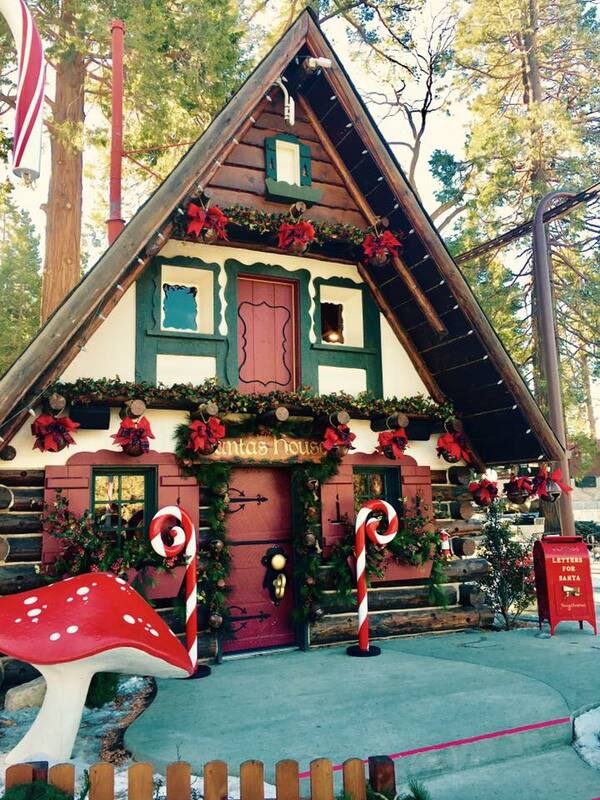 If you go to Santa’s house during a summer visit and knock on his door, you’ll hear him snoring. Fast asleep, resting for the busy holiday season ahead. It’s really cute. 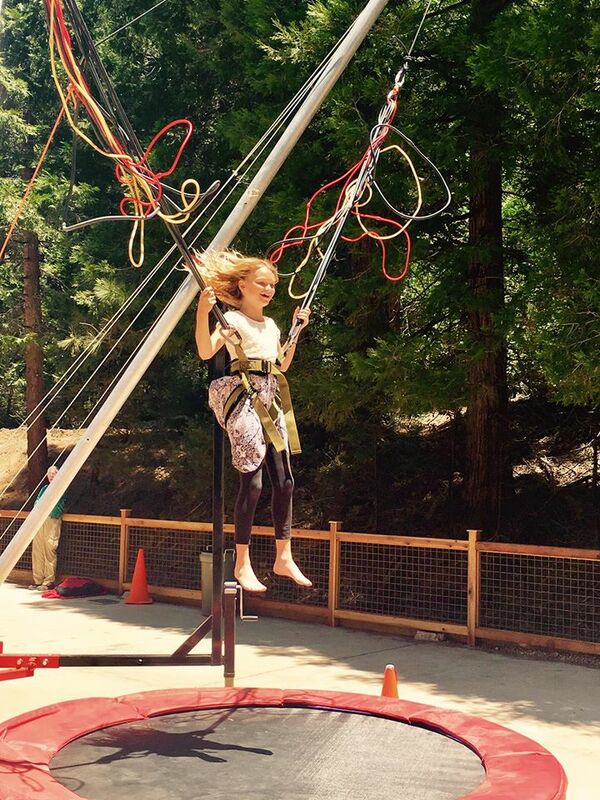 Kids enjoyed so many new experiences. 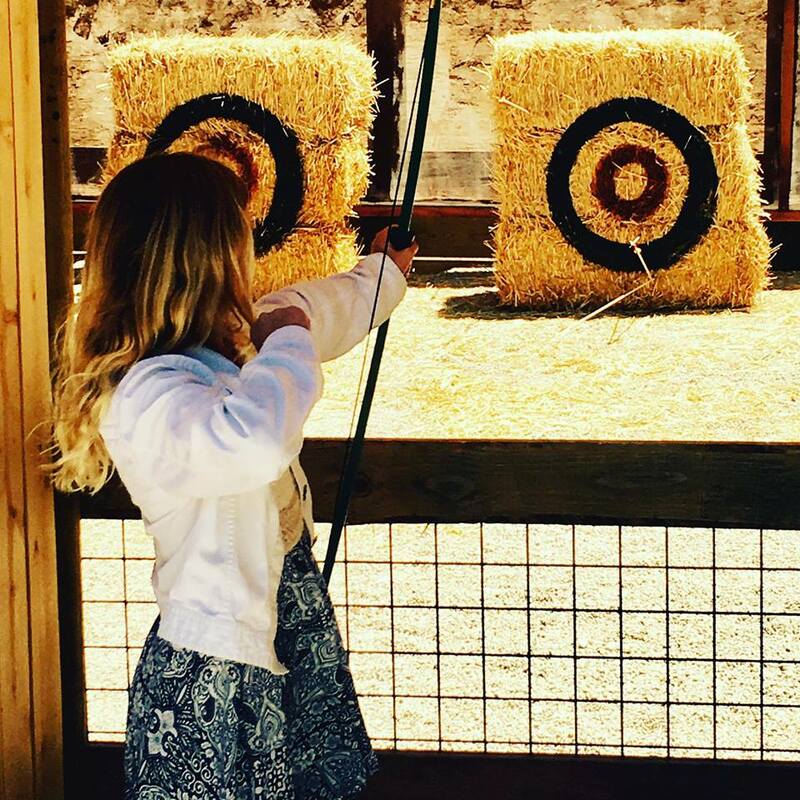 Both loved the archery range. The play structures are good for a range of ages. Can’t recall the last time I went on a walk through the forest. So nice to just breathe in the mountain air. I love how this park is “unplugged” in many ways. 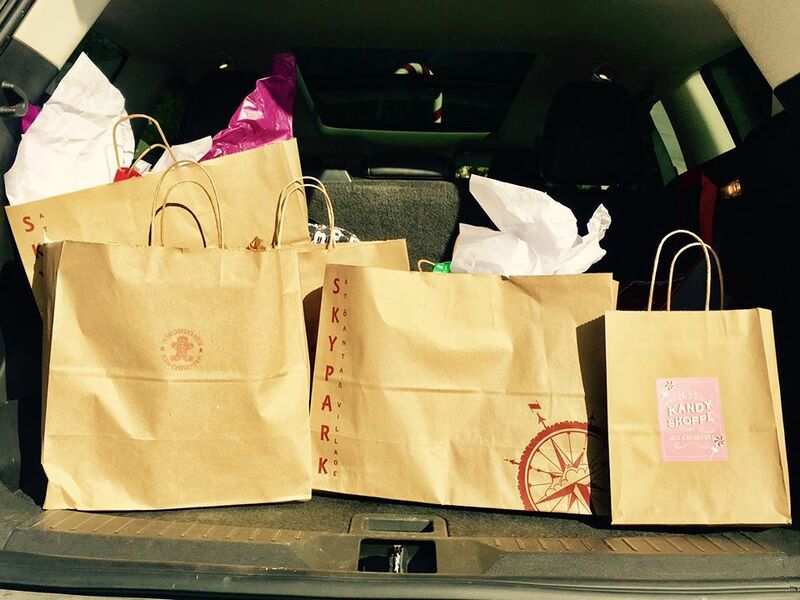 I shopped just a bit. I highly recommend this option for a nice change from the usual theme park. It’s a wonderful experience in so many ways. I purchased tickets to go here next weekend based on your review and after reading on Yelp, I’m worried about my time and money being wasted. A lot of people mention hour long waits for attractions with very few people in line in front of them. Is this something you witnessed when you were last there? I haven’t seen lines that like during any of my visits. I’ve been to the park during the holiday season in 2016, 2017, and 2018. I don’t recall those issues at all. 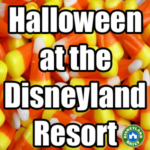 I do recommend arriving 30 minutes prior to opening and filling out the waivers you need for everyone (adults and kids) at the kiosks located outside the park. Then, at park opening, go directly to see Santa, as that line gets long quickly. I hope you have a wonderful time! I absolutely adore this park. If you think about it, please let me know how your visit went. I definitely don’t want to recommend something that isn’t a good fit for my readers. Thank you! Hi Casey, loved your in depth review of Skypark. We have a cabin in Green Valley Lake, just a few miles away, and are delighted with the reopening! The activities, beauty, costuming and warm welcome from all the employees is refreshing. 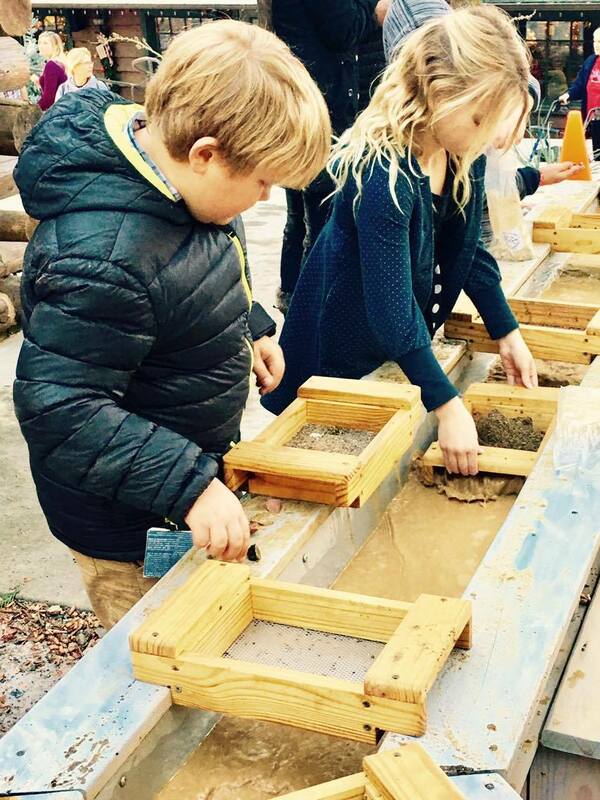 There is so much to do and see, and I especially love seeing my kids and grandkids enjoying where I went as a child in the sixties and early seventies. Price is reasonable for what all is included. Please everyone support this Gem of our Mountain! 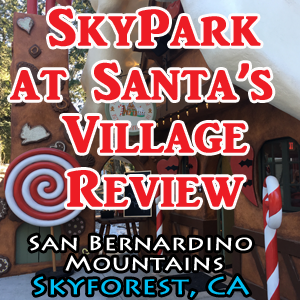 Thank you, Casey, for this exhaustive and informative review of SkyPark at Santa’s Village! You have captured the magic and wonder of the park! 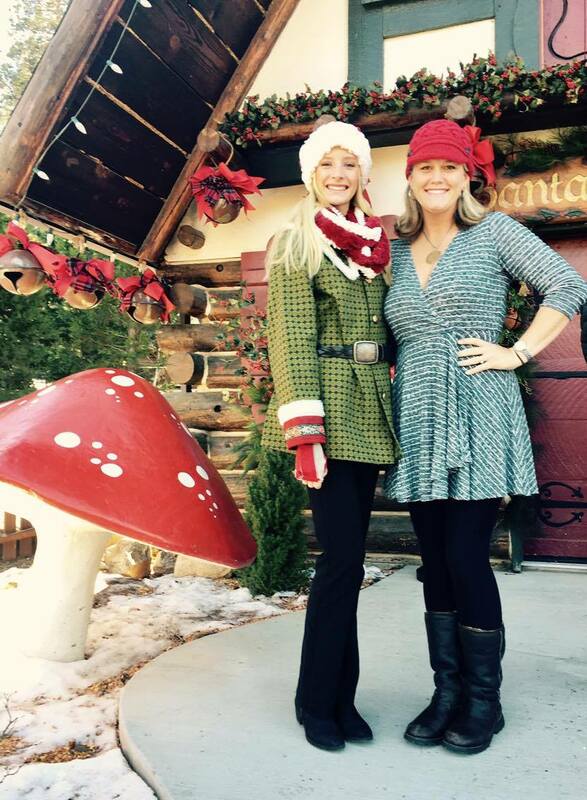 I encourage your readers to experience Santa’s Village for themselves and share their memories with others! Such a special place! We love visiting so much. Hi! 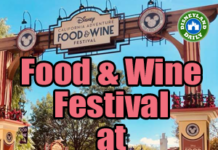 If we were to be in the area mid November, how far away from Disney and/or Legoland is this? It might be too close to Christmas to NOT go! It’s so so precious. Have to go at Christmas! From Disneyland, it’s about 1.5 hours. From LEGOLAND, just under 2.